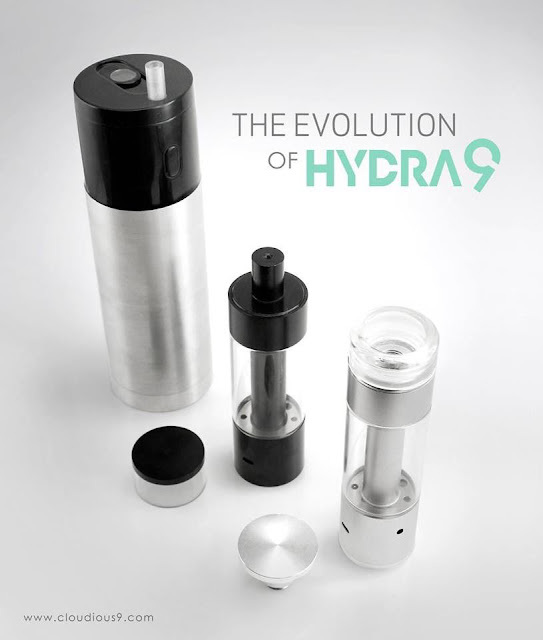 We have another vaporizer review and this is a real unique item as you will quickly learn why, but before I get to that, it is called the Hydrology 9, and was provided to me by Cloudious9. As I said, this is a unique vaporizer as it's main feature is water filtration which is something I have yet to see out of a portable vaporizer. Some additional features include a sleek glass and aluminum build, anti leak design, and five different heat settings for most any preference. Now that it has gotten some abuse and is stuck on the charger for the next couple hours, I figure it is time to see how it holds up to the others. Vaporizers are great for that smooth and clean draw which already is great, but add water and you get that great flavor without fire and it is even easier on the throat and lungs. Along with the smooth delivery from the water filtration, what may be just as smart of an added feature would be the ability stir for heat distribution without having to take it apart. The large battery that runs down the middle keeps it charged on the go and I found myself charging it twice a week and takes a couple hours to fully recharge. Lastly, kudos on topping it off with the glass mouthpiece, it is easy to clean with a solid feel. After some use, there are a couple things that took away from the experience during my usage. The first is to always use filtered or purified water as tap water in my state is hard water which make cleaning more difficult than necessary. On the topic of water and keeping a clean piece, it is highly suggested to empty after each use. While it is not quite small enough to fit in a pocket, and I wouldn’t go about storing in a purse unless emptied out as the magnetic mouthpiece cover is not strong enough to trust, it does fits well in a water bottle pocket. The charger is located on the side and it does not have a cover, so refilling takes some caution to makes sure the port stays dry. This is a vaporizer that looks like it could have been designed by a certain well know fruit named company engineer and performs just as beautifully. The draws are nice and thicker than that which I experienced with some of the smaller more discreet portable vaporizers. The only thing I would suggest to go with the stunning design would be an aluminum charging dock, but can equally appreciate the tool kit that was included with brushes to easily keep clean. The modern design and build quality stand out from any of the other vaporizers I have seen and reviewed. At the time of this review, the Hydrology 9 was not available for purchase but the Cloudious9 site has additional information along with the option to sign up for email notifications when available.